Cathedral Rock is a famous and oft-photographed sight in Sedona. The short, steep ascent up the Cathedral Rock trail to the nearly 5,000 foot summit is one of the must-do’s of a visit to the area. For running options, the Hiline Trail is a moderate singletrack which wraps around the scenic south side of Cathedral Rock. You can reach it from Yavapai Point, about halfway between Oak Creek and Sedona, near the Courthouse Vista. Follow the Yavapai Trail out to the Slim Shady Trail and take a left. After a brief jaunt on the Slim Shady Trail, you’ll run into the Hiline, which continues for about 3.5 miles. It starts with a challenging technical climb uphill, but it levels out atop a lovely plateau with views for miles around. Runners can either backtrack or return via the 3 mile Templeton Trail back to Slim Shady. 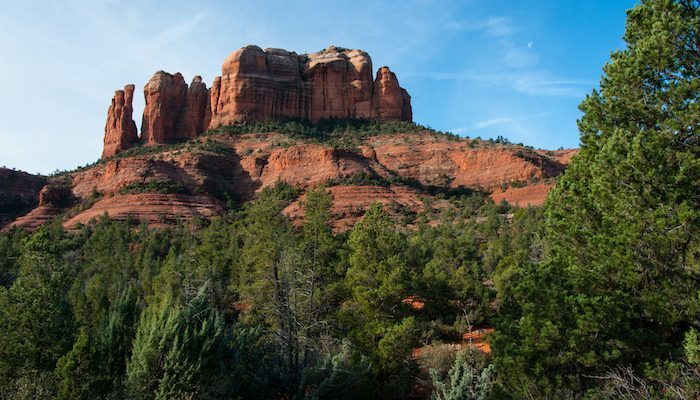 Cathedral Rock is located 2.5 miles (4.0 km) south of the “Y” intersection of Routes 179 and 89A in uptown Sedona.